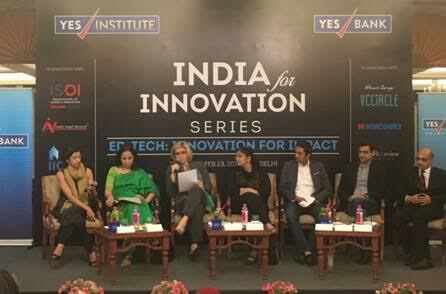 Report by India Education bureau, New Delhi: YES Institute, a practicing think-tank, under the umbrella of YES Bank, hosted the inaugural ‘India for Innovation Series’. This is the first in a series of monthly convenings with the aim of the catalyzing role of entrepreneurship and technology in social sectors such as – Education, Healthcare, Agriculture, Women Entrepreneurship, CleanTech amongst others. Taking forward YES Institute’s dialogue, the first convening in the series, titled “ED–TECH : Innovation for Impact” focuses on transforming the education ecosystem by catapulting new age Image1‘edupreneurs’ in order to transcend barriers for entry and fill gaps in pedagogies or learning tools. Key sector leaders including Mr. Arun Maira (Former Member, Planning Commission and India Chairman, Boston Consulting Group); Ms. Gowri Ishwaran (CEO, The Global Education and Leadership Foundation and Founder Principal, Sanskriti School); Mr. Marcus Brunberg (Academic Head, Kunskapsskolan Knowledge School ); Mr. Amitav Virmani (CEO, The Education Alliance) and Ms. Padmaja Ruparel (President, IAN) took part in the session. Ms. Preeti Sinha, Senior President & Glocal Convener, YES BANK & YES Institute said, “The world is comprised of the largest youth generation in history, and as a result education holds the key to the future. Quoting the UN Secretary-General Ban Ki-Moon, “People are the greatest wealth of any country, but that wealth must be built on quality education”. To achieve quality education, we need to harness technological developments and engrave them within our current education curriculums. Through harnessing technology, India will automatically elevate the quality of education provided, thereby accentuating the standardized thinking methodologies. In line with this vision, ED-TECH convening aims to promote the new age amalgamation of technology and education that is vital towards catapulting India’s youth to achieve their unrealized potential”.